Parking: Parking available at cost. Limited amount of spaces. 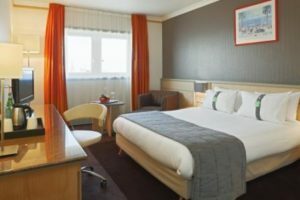 The Alliance Hotel is a 4* hotel located in the city centre of Tours, opposite the train station. With its excellent city location, trains and buses are available at your disposal, allowing guests to have the freedom to explore the Loire Valley. This hotel offers a relaxing stay in a modern and calming atmosphere, with 105 rooms, designed to ooze peace and tranquillity and a relaxing sauna, your stress just melts away! This Hotel has a gourmet restaurant offering a delicious range of traditional French cuisine. The alliance hotel is located in the capital of the French language, allowing guests to explore the beautiful city with ease, whether it’s on foot or with local public transport. It wonderfully situated in an ideal environment which allows guests to get involved in all sorts of activities, especially those which offer gastronomic and wine routes. Furthermore, with its city centre location guests can visit the famous Loire Valley wineries with ease. This hotel priorities the comfort of their guests and therefore offer a top quality service in order to ensure a relaxing stay. With its expertise in hospitality, the staff remains at your disposal with a 24 hour reception desk. The hotel has a variety of services which allows you to mix business and pleasure, with a range of meeting rooms and relaxation opportunities, this hotel is perfect for all whether it’s a business trip or a relaxing break! Facilities such as the sauna and fitness suite encourage guests to unwind and diminish all worries. Guests can also enjoy a variety of traditional French cuisine at the hotel’s delightful restaurant. Each room is tastefully decorated creating a sense of relaxation. Each room is equipped with air conditioning, a safe, TV, telephone as well as bathroom amenities.